Nathan Lewis grew up in the village of Barker, New York, about three hours from Meadville. He joined the U.S. Army straight out of high school. He was 19. Roman Baca was born in Albuquerque, New Mexico, and grew up in Spanaway, Washington, just south of Tacoma. After high school, he studied classical ballet at a conservatory in Connecticut. At 24, he joined the U.S. Marine Corps. Both men served in Iraq. Lewis deployed with an artillery unit in 2003. Baca deployed to Fallujah in 2005. They came home changed by their experiences. They came home with questions. Lewis and Baca are part of Combat Paper: Word Made Flesh, a week of events addressing issues of trauma, grief and loss through the arts and artistic expression. The conference and art exhibit represent the collaboration between two new faculty members, who found a common interest and purpose. Alexis Hart is a Navy veteran and professor of English and director of the Writing. Steve Prince is a printmaker, sculptor and professor of art. Together they created a program that crosses disciplines and seeks to bridge the military/civilian divide by creating art and conversations around the artistic experience. “What does a person do when you come back from war?” That was Baca’s question. His sole role model was his grandfather. Baca tried to follow his grandfather’s example. Get a good job, a desk job. Buy a house. Settle down. For his first six months, he thought he was transitioning back well. His wife told him wasn’t. He was angry, anxious, depressed. She asked him a question: if you could do anything in the world, what would you do? “Start a dance company,” Baca said. His wife is a ballerina. Let’s do it. Together they built Exit 12 Dance Company. His early efforts missed the mark. He got feedback. Exit 12 Dance Company performed on the opening night of the conference. On Tuesday, they lead a dance workshop with Allegheny students. With the dances, Baca said he wants to bring the military experience to the people back home. He wants them to feel the fear, anxiety, longing that is so prevalent in day-to-day life in war. Lewis came home and wrote in journals. He was having trouble reconciling the values he was raised with and what he did in Iraq. Lewis said his trauma was not from what he saw, not from what was done to him. His trauma was from what he did. 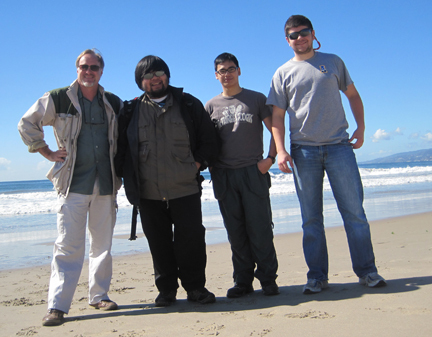 In 2007, he started working with The Combat Paper Project. In 2009, he published his first book, I Hacky Sacked in Iraq, which has a sewn binding and covers of handmade combat paper. Paper-making is an ancient art and process, originating in China. Paper was made from rags, Lewis said. In The Combat Paper Project, people can bring any natural fiber cloth that has sentimental value. Veterans donate uniforms. On Tuesday, journalism students cut up uniforms that had been donated by active-duty members of the military at Walter Reed Military Medical Center. The pieces were turned to pulp in a big tumbler/blender called a hollander beater. 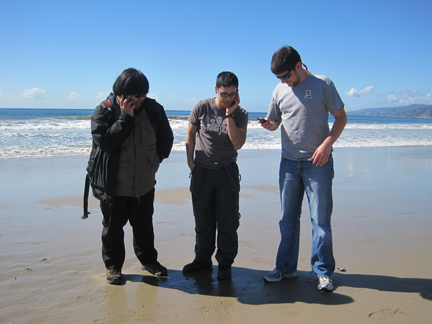 The students dipped a framed screen into the water and pulp mixture and “pulled” the paper onto the screen. After draining the excess water, they turned the screen over and gently lifted it to reveal a sheet of handmade combat paper. Prince believes the paper-making process is a metaphor for transformation, creation and healing. “The deconstruction is not destroying. Those are two different words,” Prince said. Through the creative process of breaking down and rebuilding, people can find empathy for another human being, regardless of race, class, gender, sexual orientation, he said. “That’s the power of this project. It calls you to use your heart,” Prince said. Lewis has a tattoo of a paper clip on the outside of his right arm, near his elbow. His paperclip is embedded in each piece of combat paper he creates. It’s his watermark. It’s also a historic anti-war symbol. “I identify strongly with being an anti-war vet, which doesn’t mean I’m against the troops,” Lewis said. “My morals were off in Iraq. Baca and Lewis have broken down their war experiences and turned them into dance, poetry and paper. “It boils down to purpose and the future,” Baca said. He wants to expose the nation to the experiences of people living in war zones. Lewis noted that in Vietnam, the people have turned old weapons into agricultural equipment, musical instruments, rolling pins. People who’ve seen a lot of war have found ways to transform weapons. “You’re a weapon in the military,” Lewis said. He is not religious though he fond of one verse, Isaiah 2:4. When I graduated from college, I had no job. I was told to get an unpaid internship to build my portfolio. Even then, I balked. I didn’t like the idea of working for no money; however, I relented and found a gig at the local daily newspaper. A calendar with a bikini-clad woman straddling a motorcycle greeted me in the darkroom. It was the worst version of a Cinderella story. The two male staff photographers envisioned my job as a step-and-fetch, answer-the-phone, do-what-we-don’t-want-to-do internship. Instead of mentorship, they offered me their disdain and the dregs of the assignments. I poured my energy and enthusiasm into each one, assuming I had to prove myself. One day, a presidential candidate was passing through town and everyone on staff was covering his visit and speech. I was thrilled. I had no hope of getting a plum assignment or photo position; however, I knew I’d get a shot at photographing a major news event. I’d get to go to the party. After all, I’d paid my dues. The photo editor assigned me to the newsroom, to answer phones, file negatives and cover any other news that might come up. What? There is no other news. 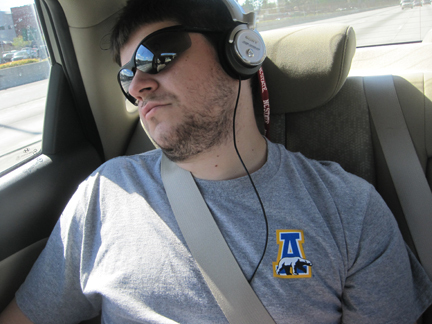 Then and there I realized the editor and his sidekick were not interested in offering me learning opportunities. I went to the managing editor. Of course you can cover it, he said. I covered the event and left the unpaid internship. I hopped on a plane to Cairo. I figured if I had to make no money I’d rather be where I was doing what I wanted to do. Out of the frying pan. Into the fire. Egypt—then and now—is not an easy place for women, especially for a single, foreign woman. Photojournalism—then and perhaps less now—is a male-dominated profession in the U.S. and Egypt. I first landed a job at a monthly English language magazine. As an independent photojournalist, I also got regular assignments from the wire services, Reuters and the Associated Press. Later I photographed assignments in the Middle East and Africa for photo agencies in Paris and Milan. On one occasion, I went to the presidential palace for a press conference. I arrived an hour early to get a position. There was only one other woman in the press corps that day. Just before the conference started, an Egyptian TV cameraman walked in and set up his tripod and camera directly in front of me. Naturally, as a woman, I was invisible to him and had no place there. I knew it was risky and ill advised to challenge him; however, I needed that camera position to do my job. There was a heated discussion among the journalists and a scene. He eventually shifted his position. A few weeks later, I was back at the presidential palace to cover an event with a visiting delegation of United States congressmen. The press scrum had tripled and included U.S. traveling press from major TV networks and newspapers. The same Egyptian TV cameraman set up his gear directly behind me. Each time I raised my camera to shoot, he pushed me, jarring my arm and ruining the photograph. I decided to escape his retaliation and move. As I left, I shoved him so he would give me room to shift position. He turned and punched me in the face. I did what I learned in Egypt. I made a scene. A woman from CBS said she’d file an official complaint. A melee ensued. The congressmen looked confused as the security guards rushed them from the scene and swarmed the journalists to pull our presidential credentials. I quickly tucked my presidential press pass inside my shirt and covered it with my hands when the guards tried to strip it from me. I pointed to the cameraman. Strip his credential. He punched me in the face. He lost his credential. I kept mine. If I sound like I was tough, I wasn’t, truly. I took a lot of punches—literally and figuratively—in my career. I’d get the wind knocked out of me and I’d get back up. As an Army brat, my father raised me with stern instructions not to rock the boat or talk back. And definitely not to challenge authority. I told my father years later that it was crippling advice for a woman in a man’s world. This semester, I’ve been mentoring a student who wants to be a sports reporter. I arrived at a basketball game one evening and discovered a row of men seated at the long bench that serves as the press table. There was no place for the young woman reporter. I asked the men for a seat for her. Most ignored me. A few glanced in my direction. A couple shrugged and turned their backs to me. They didn’t make room for her. I climbed up the bleachers and found the director of sports information. At first, the men found a seat on the cement stairs next to the press table. No. A seat at the table, I insisted. The next game I arrived and found a large paper with the reporter’s name and publication taped to the press table. She had an official, reserved spot. I showed her the paper and made a photograph of it. You have a seat at the table, I said. Literally and metaphorically. This is important. Remember this. No one is going to give you anything. You have to ask for it. Then you demand it. Then you take it and own it. You have every right to have a seat at the table. This week I am proud to announce the inaugural Allegheny College internship at the Pittsburgh Post-Gazette. A woman and non-traditional student will be a features reporter for 10 weeks this summer. She’ll have an accomplished staff journalist as a mentor. And she’ll be paid for her time and talent. Years ago, I was working in my father’s home office. I grabbed a gold Cross pen to sign a letter. Hours later, my dad wanted to know where the pen was. He was insistent. What’s the big deal, I wondered. This is the guy who tossed his medals in the trash (mom rescued them.) He long ago jettisoned the reel-to-reel tapes he’d sent with messages from Vietnam. In the more than two dozen moves of my childhood, I’d watched my dad toss plenty of our possessions. This pen was one of two treasured gold Cross pens. One was a gift from my mother. The other was from a solider that had served with him. The soldier had “go on guts” inscribed on the pen. The soldier admired my father and his approach to leadership. As the daughter of a soldier, I wasn’t always fond of my dad’s leadership style. I often conjured the image of Yul Brynner in “The Ten Commandments” portraying the Egyptian pharaoh Ramses II: so let it be written, so let it be done. Once, following my father up the stairs in a building at Fort Leavenworth, we passed a soldier who was descending. “Take off your hat, son,” my father said. The soldier didn’t break stride or say a word. He yanked off his hat and kept moving. It made an impression on me. Grown men followed his orders. I didn’t stand a chance. At another military base in my youth, I was home in the early afternoon when the phone rang. I thought I’d be reckless and answer it the way civilian kids do. Just for fun. Just one time. “Who’s house is this?” my father barked. I couldn’t spit the words out fast enough. My father is a man of few words and a man of his word. He raised us to be accountable for our actions, to tell the truth and to respect our elders, especially my mother. He promised if we told the truth, he’d have our backs. No matter what. When I was 16, my dad and mom got that terrible middle-of-the-night call that parents dread. Driving home from work, I took a tight turn on a winding country road, skidded and wrecked the family’s second car, the beater Bug my dad used to commute to work. “You were driving too damn fast,” he said, as he drove us to the hospital. The swear word and the silence that followed made his point. He never said another word about it. 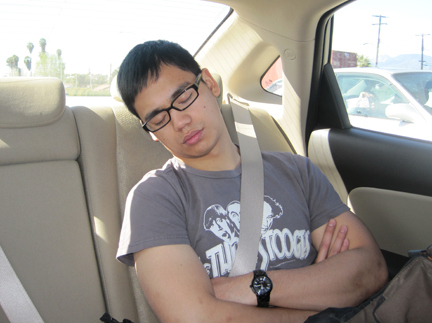 Days later, he took me to purchase my first car. I’d saved my money. I’d agreed to make the car payments and cover the cost of the insurance, gas and repairs. I assumed responsibility for the car and my actions. My dad trusted that I’d learned my lesson. When I was a teen, I asked my dad if I could stand in line all night to buy tickets to a Led Zeppelin concert. It would mean missing school the next day, too. He said yes. And when I asked to take my younger brother, a budding drummer, to the concert, my dad said yes. He trusted me to look out for brother and myself. In January, Dad told us the doctor had found a shadow on his pancreas. Shadow and pancreas are not two words I want to hear in the same sentence, particularly not after cancer has stalked several people I love, claiming two, in the past couple years. I flew home when the first procedure was scheduled. I arrived and learned that it had been postponed; the doctors required additional tests. In early March, Dad underwent the initial procedure and I wasn’t there. I was at Allegheny hosting our second annual photojournalism conference. The family waited for the results: cancer or not cancer. Dad called one day while I was meeting with a student. I excused myself and took the call. It’s not cancer. Good news. It could become cancer. Not the best news. I’m an optimist. My dad’s a pragmatist, a soldier, a combat engineer. He gathers information. Weighs options. Then he goes on guts. I like the expression and its double entendre. Go on guts implies following your intuition. To me, it also means to act with resolute bravery in the face of a daunting challenge. These past few months have been tough for my father, a family man. Though he’s a man of faith, Dad’s facing his mortality. I sense that he doesn’t want to leave my mom. I believe that alone gives him a huge tactical advantage. Dad did his research. He discussed his options. He chose surgery. Go on guts, Pop. Go on guts. 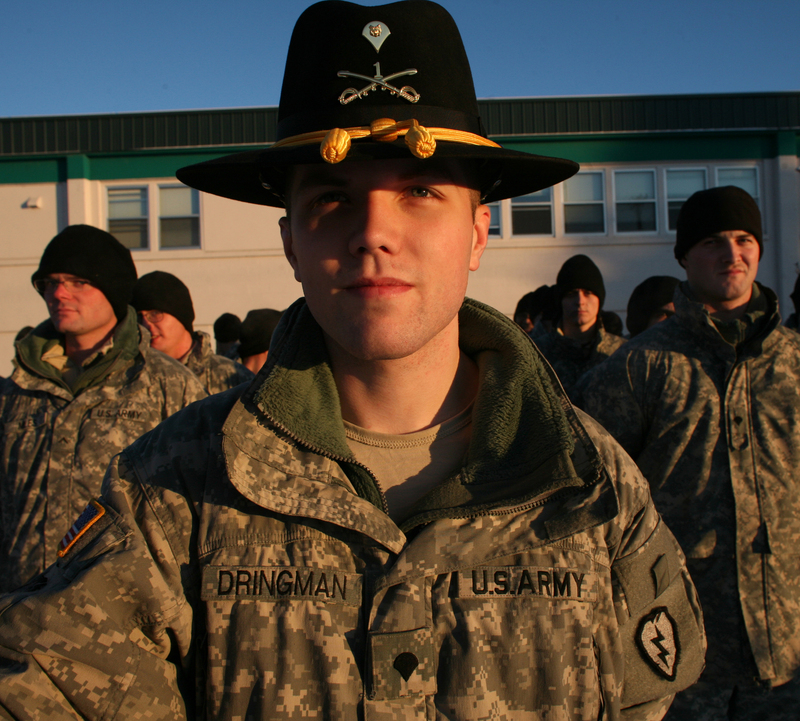 Specialist Travis Dringman, 20, from Danwood, Wash., guideon bearer for Bravo Troop, participates in a Veterans Day ceremony for the Fifth Sqaudron First Cavalry Regiment at Fort Wainwright, AK, on Wed., November 10, 2010. The troop commanders honor the tradition of the calvalry by wearing the Stetson hat and spurs. The 5/1 Cav honored their 11 soldiers killed in Iraq between 2005 and 2009. I called and said I wanted to attend. He said he’d meet me at the gate at 14:30. I ran the calculations quickly: 20 minutes to get home and grab my gear, 30 minutes to get to the base. I had just enough time. I dashed home, grabbed my camera gear, extra batteries, extra clothes, a notebook, tossing everything in one bag. I figured I’d have time to get organized when Maj. Mattox drove me to the site of the ceremony. I arrived on time, a minute or two ahead of Maj. Mattox. As he drove, he briefed me on the ceremony and the protocol for me, as a member of the media. 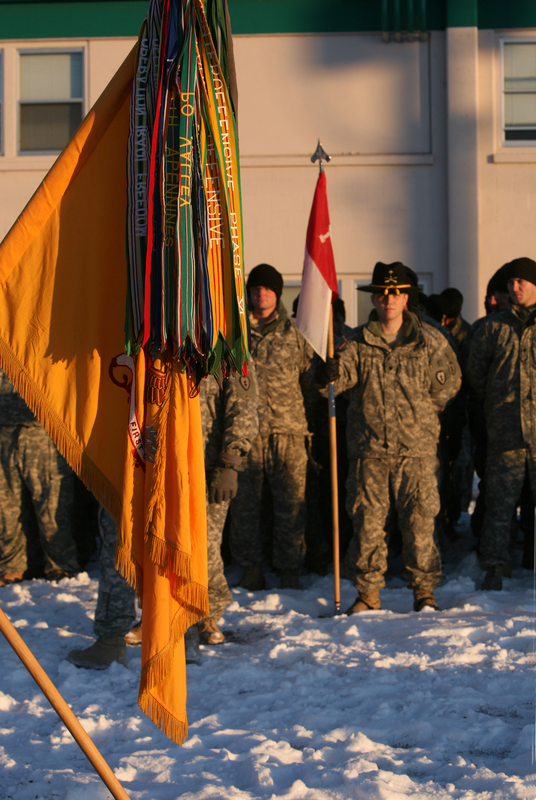 On Veterans Day 2010, The 5/1 Cavalry honored 11 soldiers killed in Iraq between 2005 and 2009. The campaign streamers on the flag represents the squadron's long history of battles and war service. As the daughter of a soldier, I knew the protocol: Be respectful of the soldiers and the family members in attendance. I moved quickly. The light was gorgeous. Snow and brass sparkled. I didn’t have much time before the ceremony began. As a photographer, I felt great to be shooting again after so much time teaching in classroom. As a military brat, I felt honored to be present. I’m including a number of photographs here because some of the soldiers and my students at University of Alaska Fairbanks have asked to see them. Command Sgt. 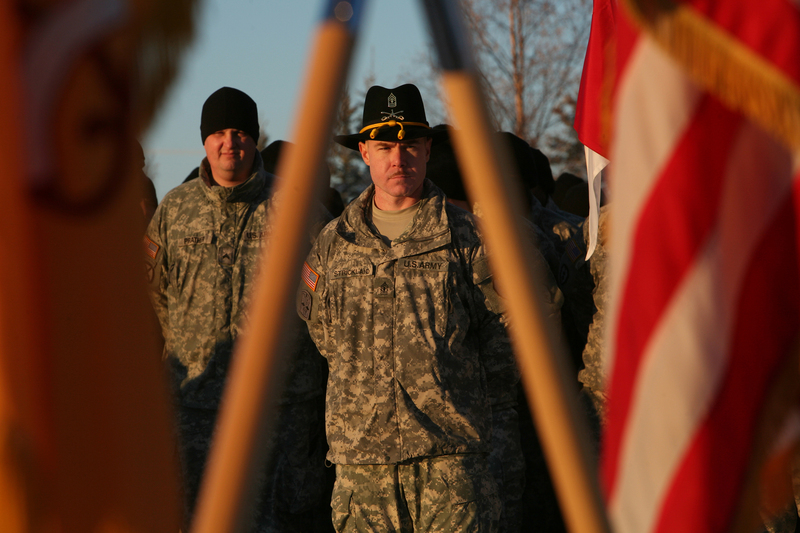 Major Joseph McFarlane stands facing his troops before the start of a Veterans Day ceremony for the Fifth Squadron First Cavalry Regiment at Fort Wainwright, AK, on Wed., November 10, 2010. The 5/1 Cav honored 11 soldiers killed in Iraq between 2005 and 2009. 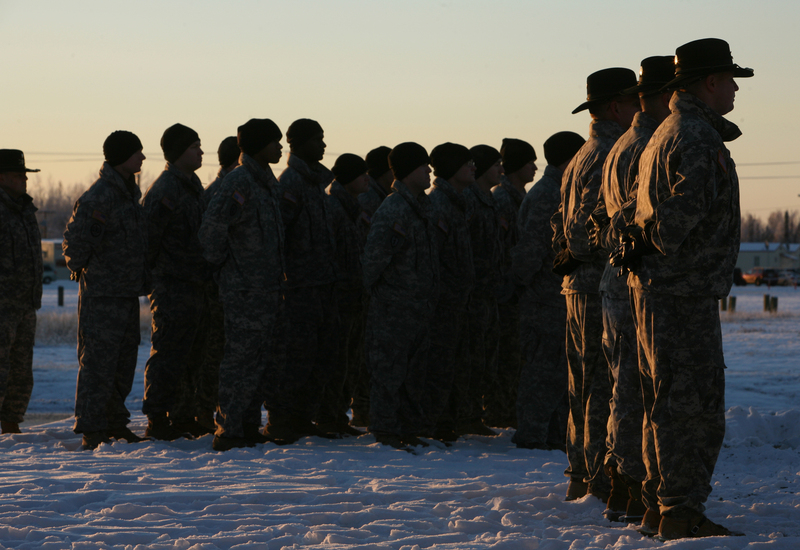 These soldiers are scheduled to deploy to Afghanistan by early spring 2011. First Sgt. Leonard Strickland, from Bainbridge, Georgia, waits for the start of a Veterans Day ceremony for the Fifth Squadron First Cavalry Regiment at Fort Wainwright, AK. 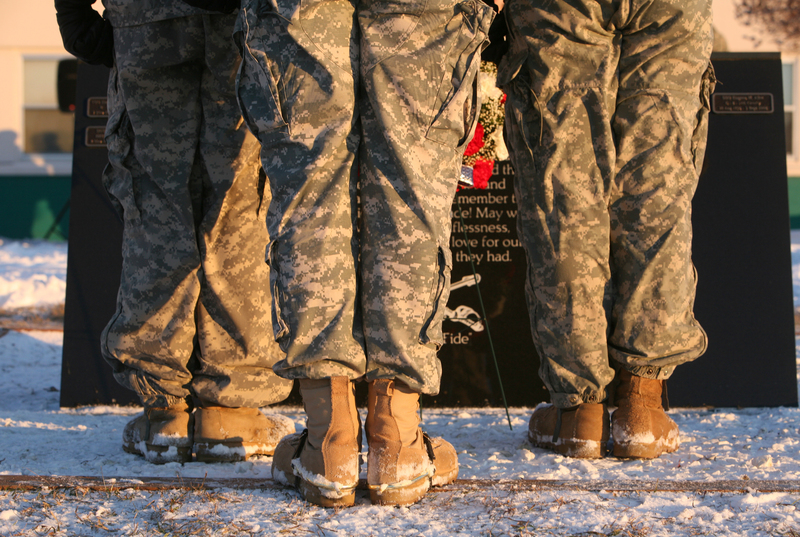 Soldiers lay a wreath at a memorial plaque during a Veterans Day ceremony for the Fifth Squadron First Cavalry Regiment at Fort Wainwright, AK. The troop commanders honor the tradition of the calvalry by wearing the Stetson hat and spurs. Between 2005 and 2009, the 5/1 Cav had 11 soldiers killed in Iraq; their names are listed on the memorial. 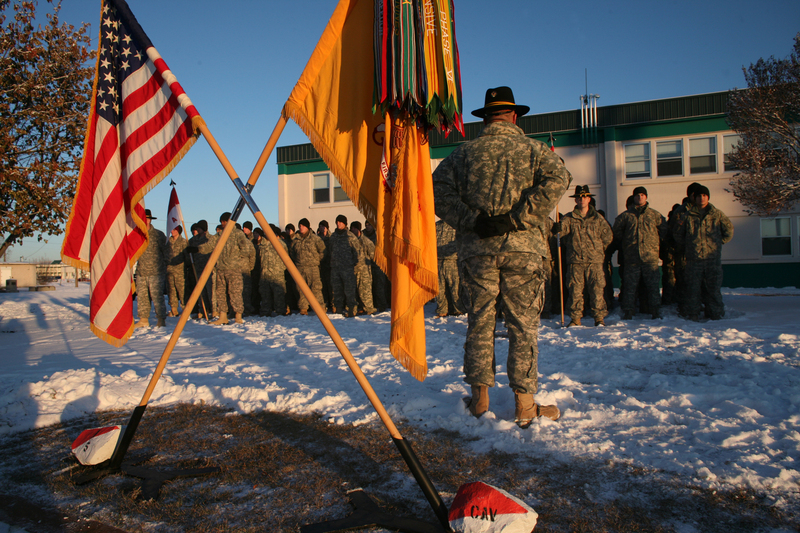 Soldiers participates in a Veterans Day ceremony for the Fifth Squadron First Cavalry Regiment at Fort Wainwright, AK, on Wed., November 10, 2010.